In today’s information age, the clichéd old-school private detective has dropped their fedora and library card and turned to the Internet and investigative databases to gather intelligence. Although this approach has tremendous value for its speed, cost effectiveness and ability to broadly search a wide variety of records, relying on the Internet and database records has exposed inconsistent and erroneous information. 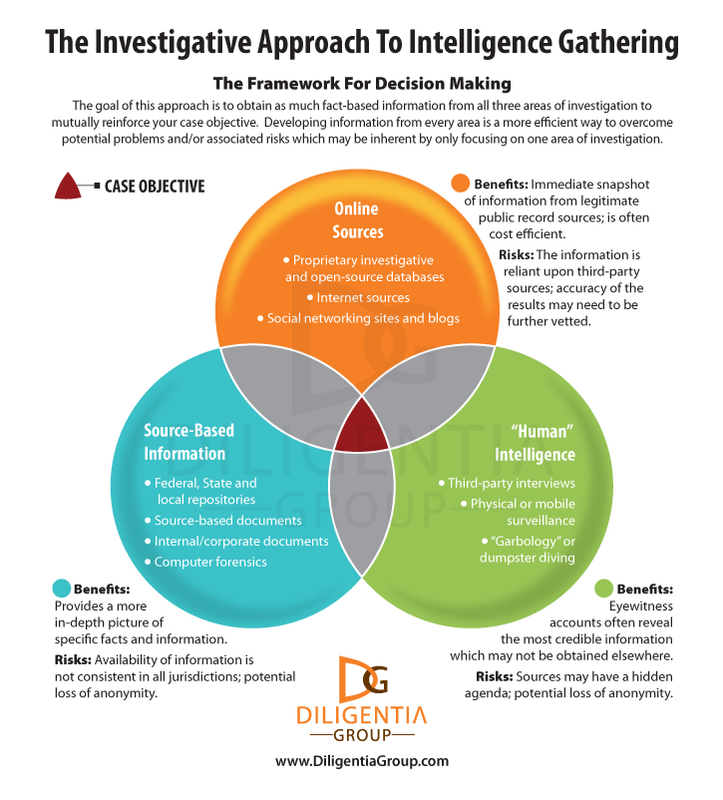 We have found the most effective and thorough way to gather intelligence is to utilize a multi-pronged investigative approach. The key to this investigative approach is to identify mutually supporting information from various disparate sources to gather a more accurate, comprehensive and complete picture. 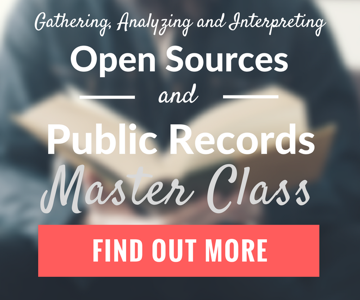 Online Sources: Proprietary databases and online sources offer a quick, easy and cost effective way to aggregate information. Source-Based Information: Online sources are quick and easy, but if you want to obtain more in-depth information on facts and information, there’s no better place to go than the source. “Human” Intelligence: Includes information which may not be obtained elsewhere including from interviews, surveillance or dumpster diving. Each approach provides its own benefits and risks, but when used collaboratively, they provide the best opportunity to uncover critical information. A review of state securities regulators records disclosed that a candidate at an international investment bank was the subject of an ongoing criminal probe in South America. This information was not available through FINRA’s BrokerCheck system which is available on the Internet. Database searches through criminal record repositories and database records did not identify any criminal record information on the subject of a background investigation, but a review of records at the local courthouse disclosed that the individual had been previously arrested for battery. The record was not identified through other sources because the name was misspelled when the court provided the information to the outside sources and database providers. An investigation into one of the main principals of an acquisition target did not identify any risk-relevant issues in open-source records, but interviews with former employees disclosed that two former secretaries had previously made allegations of sexual misconduct. These allegations did not show up in the public record because charges had not been formally filed. Four days of surveillance did not reveal any activity for an individual who was allegedly disabled and unable to work, but additional research identified that the individual had set up a corporation in New York and research later disclosed that the individual was running an Internet consulting business out of their house. This investigative approach does not detract from the value of the information obtained from any one of the three distinct areas. In fact, in certain cases, using only one of the three approaches may be the most effective route to accomplishing the case objective. However, using this three-pronged approach gives a private detective multiple weapons to identify fact-based information and overcomes potential problems and/or risks which may be inherent in only focusing on one area of investigation. This is not a ground-breaking approach, but in today’s Internet age people tend to rely too much on quick and easy solutions. For any private detective, gathering as much intelligence and information as you can from various sources can ultimately lead to making better decisions and ultimately reaching the client’s case objective. Very useful infograph. In Bali one of the main obstacles we face is the fact that information is not computerised or centralised. This means it can be difficult to get facts through desk research. Basically this means we need to do more leg work for intelligence gathering. This means visiting official offices to get information. Best info I ever get, especially in tracking people down (my specialty) is always from other people. Databases and records are very helpful, but you gotta beat the streets to get the best info..only my opinion of course..
With missing persons, there is no question that human intelligence is one of the best sources. But with other types of locates (long lost relatives, friends, etc. ), databases and other records are probably more important. Obviously, it depends on the case though. I am trying to get ahold of a competiors contact for how they make earn there income. The information I need is how they earn money using advertising I just need to company they use to get there advertising revenue. Please give us a call to discuss further. I am interested in getting a property profile on a litigant that owns or owned property in California, Florida and perhaps Canada. He is to be deposed on 9/1/15 so I would need some data before that time.